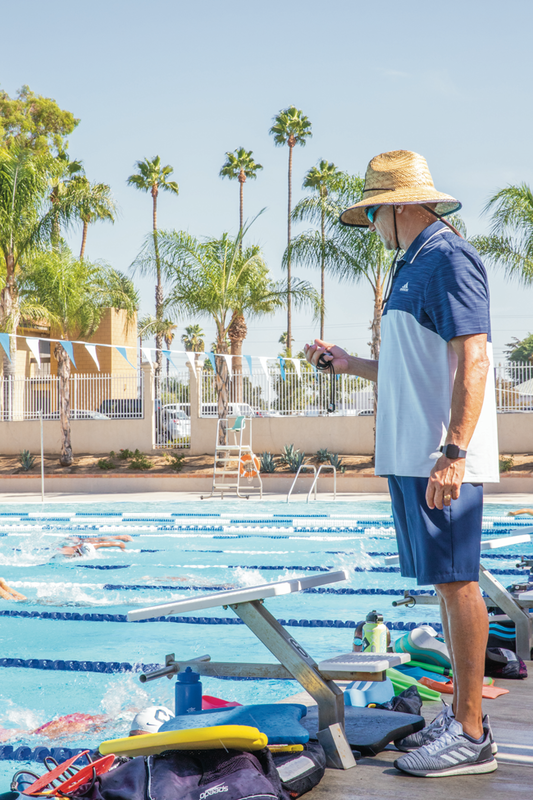 This year marks not only the 20th anniversary of the CBU aquatics swim and dive program, but also head swim and dive coach Rick Rowland’s 20th year of coaching at CBU. During the 1998-99 season, Rowland, who was hired as director of aquatics, started recruiting athletes to join the CBU family. Since then, Rowland built the swim and dive team from the ground up, including a stint as the water polo coach. Since starting the program in 1999-2000, Rowland witnessed his athletes capture nine NAIA National Championships, nine NCAA Division II top-14 finishes and an NCAA Division II national runners-up finish. The program has also se- cured 67 individual men’s national championships and 44 individual championships. Transitioning from NAIA to NCAA DII, and now to NCAA Division I, the swim and dive program has undergone substantial development because of Rowland’s influence. Josh Fluetsch, senior kinesiology major, has swam for Rowland for four years at CBU. Fluetsch said Rowland’s mind- set positively influences the team. Fluetsch said not only does Rowland know the importance of hard work but he also knows where the heart of the team should be focussed. “(Rowland) emphasizes that we are not just athletes, but Christians too,” Fluetsch said. Thanks to his success record and athletes’ admiration, it is apparent he has made a lifelong impact on both the individual athlete and the pro- gram in its entirety, creating a network of connections and relationships. Je Couto, head dive coach, graduated from CBU as a diver and then went on to coach alongside Coach Rowland. Starting from nothing, Rowland has accomplished a lot during his time at CBU and continues to push his athletes and grow the program. It takes a special type of person to create a team from scratch and lead them to multiple national wins. Luckily for CBU, Coach Rowland is just the person for the job.